The B2B-100 All MOS-FET STEREO POWER AMP featuring 110/W per channel is housed in an all aluminum chassis, entirely made in the USA. The bottom fold is .125” thick, while the back and top are .09” thick. They have been stamped, folded and powder-coated for a handsome long-lasting finish. The front panel is .375” 6061 Plate that has been precision machined, then grained and hard-black anodized. The two sides of the amplifier chassis are manufactured from US sourced (aluminum) extrusions. After arriving in-house as 6-foot lengths they are cut into 5” pieces to form the heat sinks. The machining process continues with drilling and tapping before they are black anodized to provide superior heat dissipation capability. We spared nothing to make the perfect housing for the B2B-100. 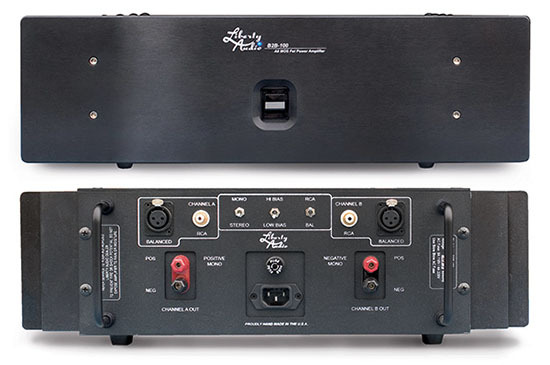 On the rear panel you will find a pair of high quality 5-way binding posts for speaker wire connections as well as two sets of input connectors. The B2B will accept both Balanced XLR and Single-ended RCA connectors. A switch is provided for selecting the input choice. There are two additional switches: one selects high bias or low bias and other switches the B2B-100 from the Stereo to the Mono-block mode. In the stereo mode the B2B-100 delivers 110 W into an 8 ohm load (200 W into 4 ohms) while in the Mono-block mode the B2B-100 delivers 350W into an 8 ohm load and more than 600W into a 4 ohm load. The heart of the B2B-100 power supply is an 800VA toroidal transformer. A pair of secondary windings feeds a bridged set of high speed rectifier diodes, one for each channel as well as a pair of voltage doublers, again, one for each channel. They in turn feed the very low noise regulators that supply the DC current for the amplifier’s L and R input sections. The amplifier is dual mono from the transformer secondaries on. In our experience we have found this to be the most effective way to eliminate ground loops within the amplifier. 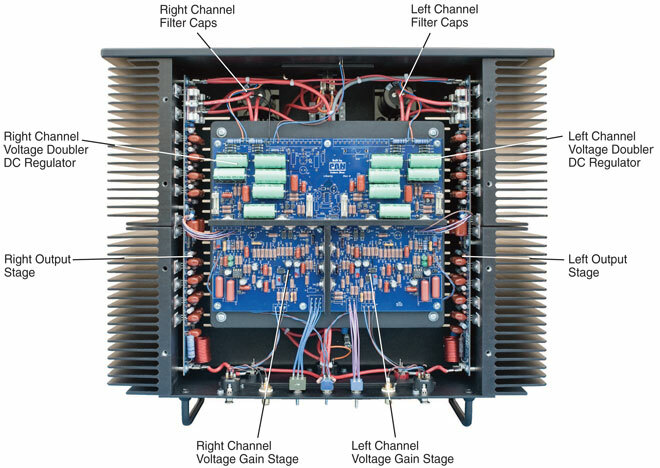 The electronic circuitry is housed on one circuit board (divided into three sections) inside the chassis: one each for the left and right front ends of the B2B-100 while the third contains the circuitry associated with the raw DC supply and the regulators. By separating the power supply circuitry from the signal circuitry, noise components are kept to minimum. The output stages and drivers are mounted on each of the heat sinks; one circuit card for left and one for the right channel. The output stage uses eight pairs of complementary International Rectifier MOS-FET IRF630 / IRF9630 devices. They are driven by the venerable Toshiba 2SK216/2SJ79 MOS-FET devices, considered by most reliable sources to be the best for this application. Accurate current sharing among the output devices is achieved by individually selecting them to be well matched in groups. Additionally a 0.22 Ohm 2W MOX resistor appears in series with the source of each output device. To ensure thermal stability the bias-sensing MOS-FET is placed on the heat sink as well. The B2B-100 produces a sound that reveals great tonal command and is astonishingly dimensional. It gracefully sculpts each detail while mastering every crescendo… rendering the finest of recordings with the highest fidelity. In short: it will bring to life every track in your personal music collection.